The best small chainsaw for any DIY tree trimmer is the one that can be used safely. Airplane pilots learn early on that any landing they can walk away from is a good landing, and chainsaw users need to think the same way. If you're up in a tree and things start to get dangerous, your first instinct needs to be to drop or throw the saw and get to safety. Small chainsaws are available in both gas and electric, and either format will work on small brush and trimming projects. If you're clearing brush or trimming trees, an electric saw will save you noise, exhaust and having to blend fuels. For those with a lot of firewood to cut, a gas-powered saw is a much more efficient cutting tool. The lightest gas chainsaw will have more oomph than nearly any electric tool. For larger projects, you'd be better off with a a g﻿﻿as-powered chainsaw. You will need gloves with cuffs to protect your hands from chips that may slide down against your skin. If you're going to be using the chainsaw a lot, vibration protective gloves are a good investment. Also be sure to wear long sleeves, long pants and eye or face protection. If you're clearing away a lot of brush, a short blade will save you a lot of tangling and mess. Take care always to use the cutting bar close to the body of the saw, rather than cutting with the tip as the saw will be harder to control the further up the bar you cut. If you're removing large branches from established trees, a lighter saw is a great investment. The best lightweight chainsaw is one with great balance and low kickback, particularly if you're working off a ladder. For pruning large branches, an alligator saw may be a good investment. Alligator saws clamp their jaws around branches up to four inches in diameter and cut through them with a circling chain rather than a bar. Their jaws are shorter than a full blade chainsaw, but you can get better control and leave a healthier cut for an existing tree. Don't be put off by the design of an alligator chainsaw. The wrapping mechanism actually does the majority of the cutting work; while it looks like a pair of loppers, you don't need to have a great deal of arm strength to use this tool. Working on the Ground: If you're cleaning up brush, work low. Trim away from the base and let small trees fall away from you. Cutting too high on a green branch can cause the flexible wood to wrap around your saw, blocking your vision and putting you in danger. Take frequent breaks and haul away brush you've cut to get it out of your way and leave plenty of space for your feet. For cleaning up larger brush or clearing a fallen tree, review the tree for roll risk. As you remove weight from the main body of the tree, it can turn, roll or settle. Make sure it rolls away from you.Be prepared to move away fast. If you're using your saw to cut down small trees, be aware that they can split halfway through the cut, and they may not go in the direction you'd like them to. Take care to not let the extension cord loop and always monitor the ground around your feet before you start. Be ready to drop the saw and run. Working from a Ladder: Be sure you're comfortable on a ladder and that the ladder is secure. Never work alone from a ladder. Set the ladder safely and have your partner foot it or brace it at the bottom so it doesn't slide. Working on a long branch? Remove weight from the length of the branch first before cutting it at the trunk; one of the nice things about wood is that it splits, but if you're cutting a large branch at the trunk and it splits, the weight of the branch may swing down, hit your ladder, knock into your partner, or send you to the ground. Additionally, a split branch can tear into the tree you're planning to save and leave it vulnerable to pests or disease. Clean cut branches will generally drop straight down safely, so cut branches off in short, lightweight chunks whenever possible. Communicate with your partner. If things go badly as you cut, you may need to drop the saw and get off the ladder in a hurry, so make sure your partner is not in the drop zone. Even the best climbing saw on the market is not worth an injury. Always be prepared to get away from the blade and toss the saw safely away if you need to. It's critically important to be constantly vigilant when using a chainsaw. This powerful tool will happily cut whatever you put in front of it and can usually cut from the top and the bottom of the blade. However, if you're afraid of the tool, or afraid of working off a ladder, you're not going to be able to move smoothly, get your work done, or get out of the way if you need to. Work with your saw on the ground and keep a healthy respect for its power before you climb with it. For those with a real fear of heights, hire someone. Makita UC4021A Electric Chainsaw 16"
The 16" Makita offers a traditionally placed brake and a soft start for great safety and cutting accuracy. However, this saw is nearly 15 pounds, so working with it from a ladder may be a challenge. The chain is self-oiling and the lubrication reservoir is easy to read. Finally, this tool will shut down rather than burning out. Arborist chainsaw reviews rate the Makita high due to power and the electric motor protection feature. The 16" Earthwise also offers a traditionally placed brake, designed so that if you accidentally push your hand forward on the saw toward the top of the blade, the saw will shut down. The Earthwise is only 10 pounds and it has a low kickback feature. The Worx 18 inch saw is just over 11 pounds of cutting power. The blade is auto-tensioned and can't be over tightened thanks to the patented single adjusting knob. This tool comes fully assembled and ready to use and features automatic lubrication of the chain. Be prepared for chatter; consider anti-vibration gloves with this tool. The Black & Decker Alligator is the best pruning chainsaw in this review. This tool is easy to control, under ten pounds and safer than a standard chainsaw. If you've never used a chainsaw before and want to start small and safe, this is an ideal tool. This is the best small chainsaw on the market for a chainsaw beginner. This 6.2-pound saw offers great cutting power and a low kickback risk. This little saw has few add-ons, so be sure to wear gloves with cuffs and long sleeves. This is the probably the lightest chainsaw on the market for the amperage and power. 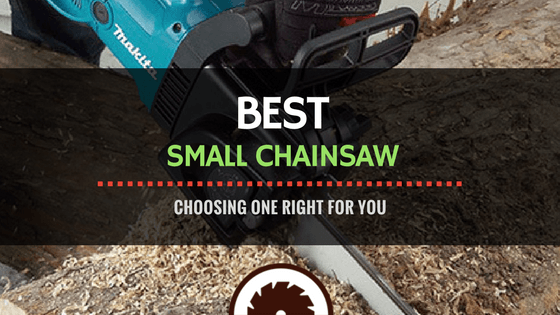 If you can choose one saw for trimming small branches and clearing away brush, the best small electric chainsaw of 2018 on this list is the Makita UC4051A. It starts slowly for great control and won't get bound up in brush and burn out, keeping you safe and preventing the need to replace it. For those with enough hand and arm strength, this saw will also work well for climbing once you are familiar with it. As previously pointed out, safety is critical when using a chainsaw. 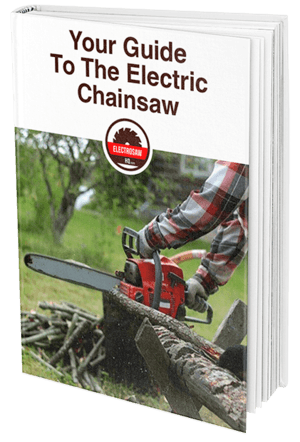 When studying small electric chainsaw reviews, always keep an eye out for kickback and chain brakes to make absolutely certain that you buy a saw that you can use safely, put away and use again next time. Eventually, you'll want to treat your chainsaw like your lawnmower and get into a schedule of yearly maintenance and sharpening for best efficiency. Be sure to buy the right saw for the majority of your projects. An oversized chainsaw can be dangerous and actually make small projects more challenging.